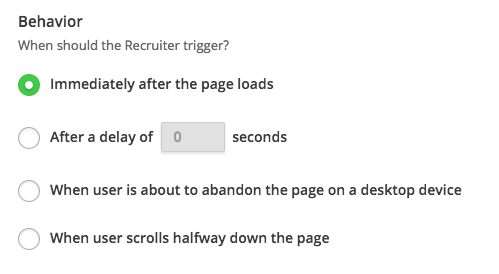 Hotjar allows you to set a behavior for when a widget, Polls, Surveys or Recruiters, should trigger on the page. This option will make the widget appear as soon as the page has finished loading. This option will make the widget appear X seconds after the page has finished loading. If you set this to 5 seconds and your page takes 2 seconds to load, the widget will appear 7 seconds after the visitor has browsed to the page. This option will make the widget appear the moment the cursor leaves the viewport - the visible area of the site within in the browser. We are unable to predict abandonment with Mobile and Tablet devices. This option will make the widget appear as soon as a visitor has scrolled down to at least half the full height of the page they are on. My Poll isn't working. What did I do wrong? For more help on setting up your Poll and troubleshooting any issues, head to Feedback Widget FAQs.